Want to offer a variety of delicious fruity flavors? This cake’s the one for you. 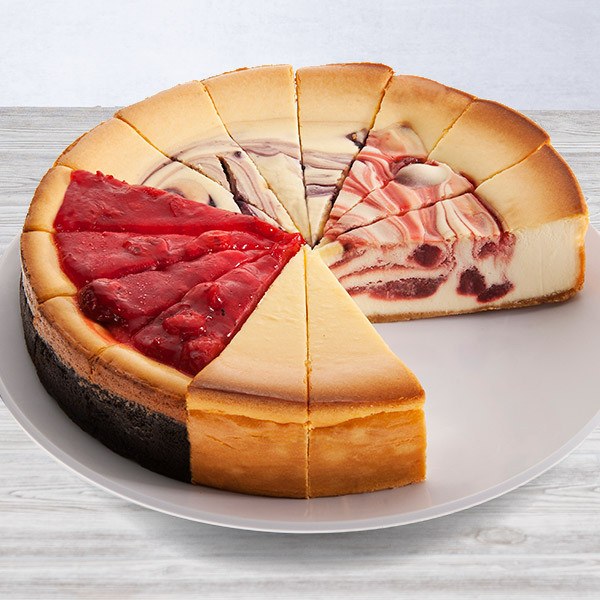 Sweet, ripe fruity flavors come together in this decadent sampler comprised of our Strawberry Swirl, Cherry Almond, Lemon Blueberry, and New York cheesecakes, creating a fabulous dessert that everyone is sure to enjoy. I ordered the 9 inch Fruit Cheesecake Sampler for friends to cheer them up and they absolutely loved it and said it was the best cheesecake and would definitely order this again. I ordered about 32 cheesecakes for Christmas gifts. We had not tried these cheesecakes before, but was very happy when they arrived and we tasted one that we had ordered for ourselves to try. It had a beautiful texture and flavor, and it came in perfect condition. We will definitely order from them again. I bought the cheesecake sampler for my parents for Valentines Day, and they both loved it. They stated it was the best they had in years! Must have bought 20 of them over the years and the recipients always say it’s the best cheese cake they’ve ever had. Buy them with total confidence. I sent this as a Christmas Gift to my boss & his wife for their holiday party, received nothing but praise about it. Also, sent them the tin of popcorn, they loved that one too. We loved the plain cheesecake, it was very smooth and tasty! We would definitely purchase this cheesecake in the future, Yum! We also purchased the fruit cheesecake sampler and found the "fruit" dry with a less than tasty consistency as well as the cheesecake being drier. 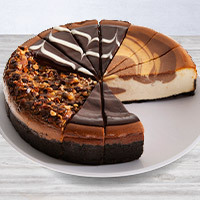 I bought this as a Mother's Day gift & my mom loved it & said it was the best cheesecake she ever had! I live 150 miles away so was unable to taste it but my siblings did & enjoyed it!